Admit it, Amazons. Sometimes you miss pasta. You know what else is true? Breakfast is the best meal of the day! So, here it is; your chance to indulge a bit in both. Sort of. 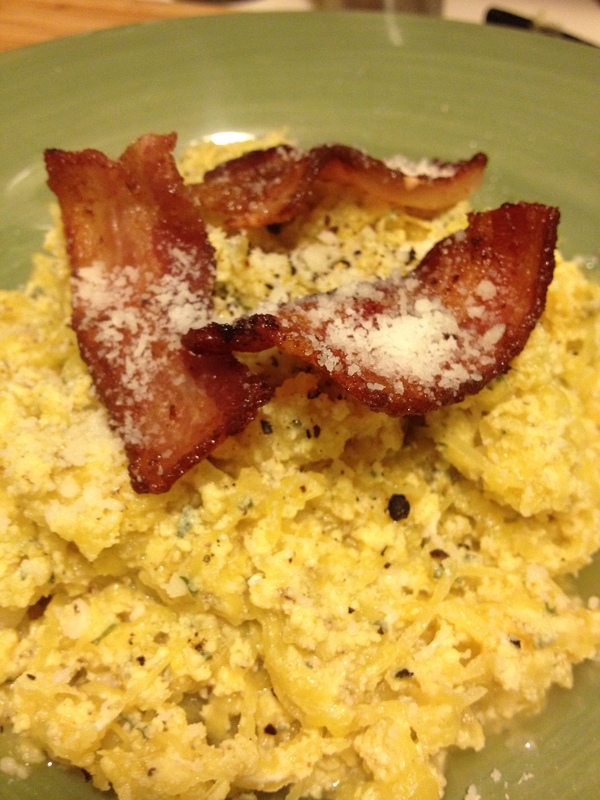 Carbonara is a classic style of preparing pasta with bacon (or pancetta), eggs, and cheese in such a way that the eggs and cheese meld over the hot pasta to create a creamy sauce. Very simple and very delicious. 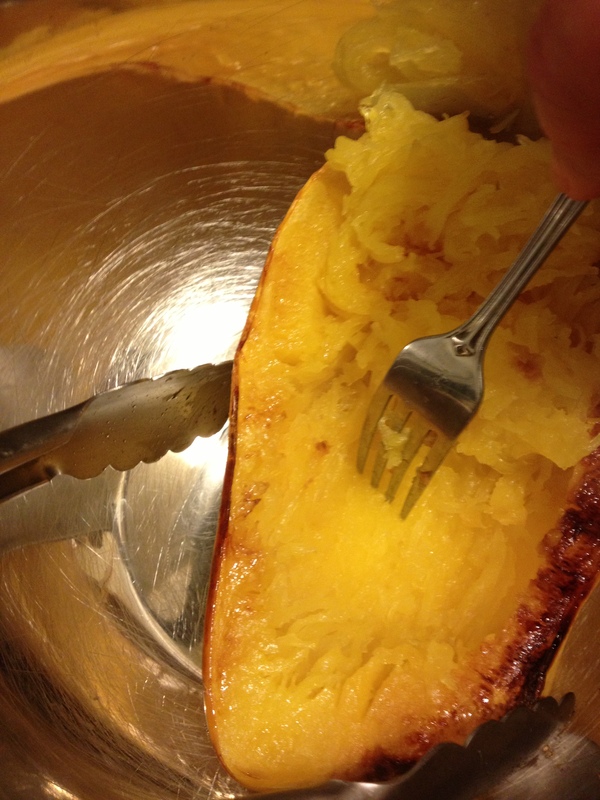 Spaghetti squash is so called because when cooked, its flesh can be scraped away from its skin in strings resembling spagetti. You can toss this stringy flesh with anything you might add to pasta: olive oil, garlic, pesto, tomato sauce, chicken, veggies, anything! I know a lot of you are avoiding dairy, but if you’re going to cheat and eat cheese, a hard cheese like parmesan or pecorino romano, like we’re going to use, is your safest bet. These cheeses are very low in lactose and high in flavor. Once your squash has been split lengthwise and seeded, drizzle with olive oil and place it cut-side down on a baking sheet and bake for 30-40 minutes. It’s also possible to microwave spaghetti squash for 6-8 minutes this way, but I prefer some of the flavor that comes with using the oven. During the last 15 or so minutes of that cooking period, start browning your bacon in the skillet over medium heat. Mix the eggs, parmesan, parsley, garlic, pepper flakes, and fresh pepper together in a bowl. Once the bacon is crisp, remove to paper towels to cool. Turn off the heat on the bacon drippings until the squash is completely prepped. Remove the hot squash from the oven and carefully place in large bowl or on a large platter. You’ll easily be able to scrape the flesh away from the skin with a fork. 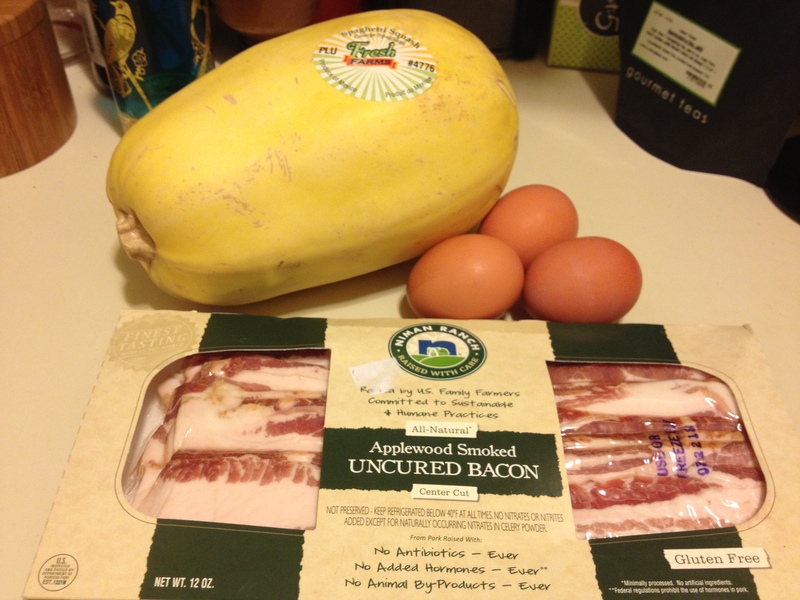 Once you have all the stringy flesh collected, turn the heat back up on your bacon drippings and add the squash. 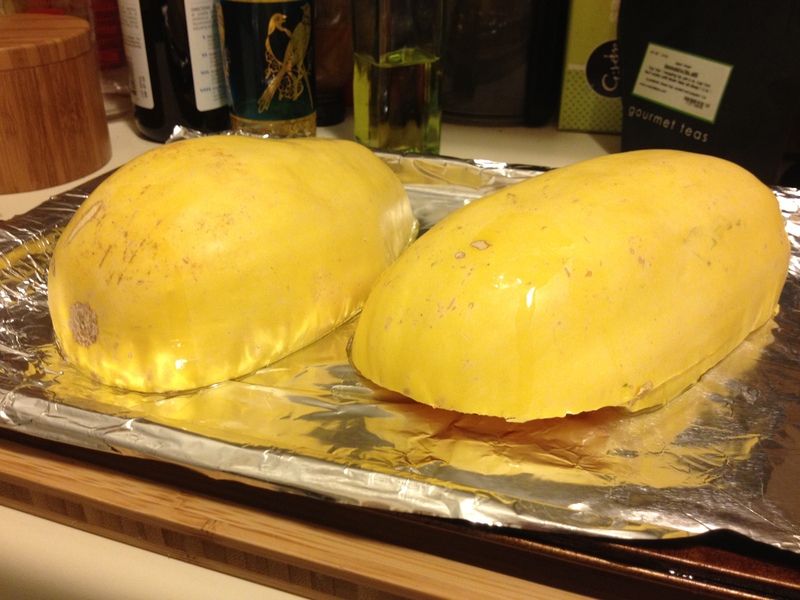 Turn to coat and let some of the moisture from the squash evaporate. Once the squash is starting to look pretty dry, add the egg mixture and stir. Never stop stirring! In a pasta carbonara, it’s usually recommended to do this off the heat, allowing residual heat in the pan and the pasta to do the cooking, minimizing the “scrambling effect.” But because of the watery nature of squash, I’ve found it more helpful to maintain a medium heat while continually stirring. You’ll get some scrambling, but it’s no biggie. At this point, add the juice of half a lemon, the reserved bacon, and a lot of freshly ground pepper to the squash and toss to incorporate. You could also add peas or roasted broccoli for a little color! Top with a little parmesan and/or bacon when serving.